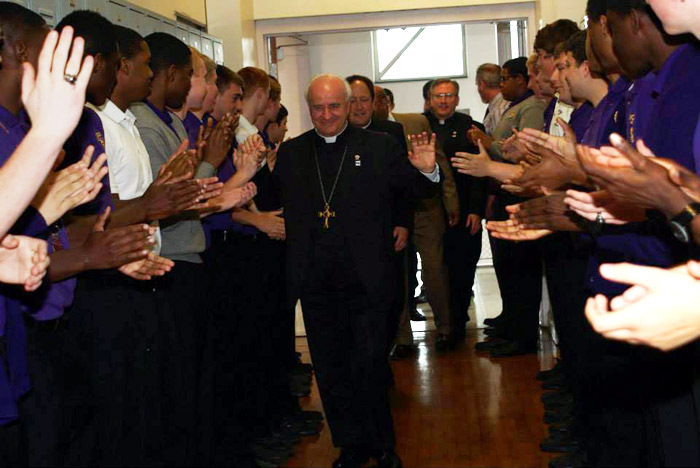 The occasion was a May 14 student assembly in the gymnasium of center city Philadelphia’s Roman Catholic High School whose boys combined with girls from nearby John W. Hallahan Catholic Girls High School to welcome Archbishop Vincenzo Paglia, president of the Pontifical Council for the Family. The archbishop dropped in during a whirlwind visit to Philadelphia as part of the preliminary tour in conjunction with the World Meeting of the Families scheduled for the City of Brotherly Love in September 2015. Through their joyful yet orderly behavior the students were living proof of the value of Catholic education for anyone who might have doubts on that score. First up on the welcoming committee was Maci Torres, a spritely sophomore from Hallahan who told the archbishop, “The theme just announced, ‘Love is Our Mission: The Family Fully Alive,’ is one that makes an impact on all of us. Next up was Roman sophomore Matthew Anticoli who certainly knows his ancestral tongue. His entire message was delivered in fluent Italian to the obvious delight of Archbishop Paglia. “Tough to follow,” murmered the next speaker, Christopher Mominey, the archdiocese’s secretary for Catholic education. He also addressed the archbishop in Italian but then translated for the general public, reiterating the invitation to Pope Francis tendered by the students. 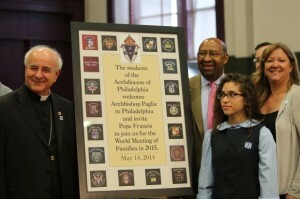 The archbishop also invited the students to serve as volunteers at the World Meeting of Families. “You can help us, apply your energy,” he said. Philadelphia Mayor Michael Nutter, who in March was part of the Philadelphia delegation to visit Rome for an audience with Pope Francis as part of the preparation for the World Meeting of Families, was also at the Roman Catholic assembly. He mentioned that he was a graduate of another Catholic high school that would be nameless because it was a sports rival of Roman (actually St. Joseph’s Preparatory School, whom most people call “The Prep”). He recalled how thrilled he was to actually meet Pope Francis. He was given a picture of the event taken by a Philadelphia Daily News photographer, which he had framed and gave to his mother for Mother’s Day. “She and her twin sister are graduates of Hallahan,” he said. 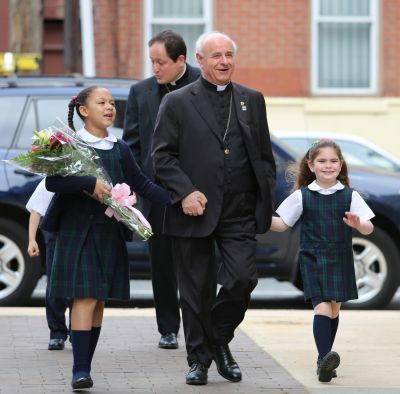 The choice of Roman and Hallahan students to welcome Archbishop Paglia was fitting because they are the two oldest diocesan high schools in Philadelphia and also because of their proximity to the Cathedral Basilica of SS. Peter and Paul, the Benjamin Franklin Parkway and the Pennsylvania Convention Center where most of the events will occur. Actually there is irony to that. On the night of Jan. 9, 1986, in that very gymnasium where Archbishop Paglia was so warmly received, approximately 1,000 Roman alumni, true sons of Thomas Cahill, filled the hall to voice opposition to a proposal given two days earlier by the archdiocese to close the old school because enrollment had dwindled and deficits had increased. 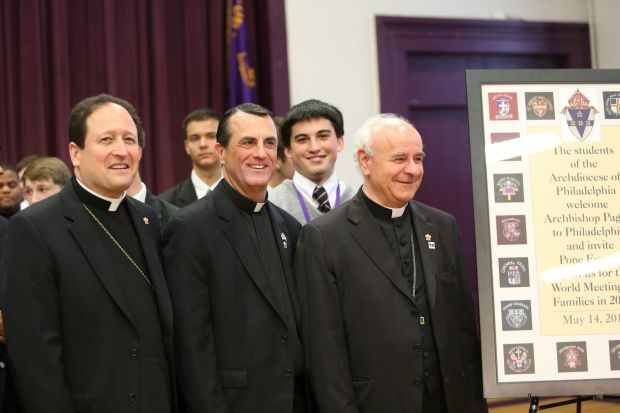 It is largely thanks to the creative fundraising and recruiting by the alumni that followed that Roman Catholic will still be there in 2015 when and if Pope Francis comes visiting. That was terrific. 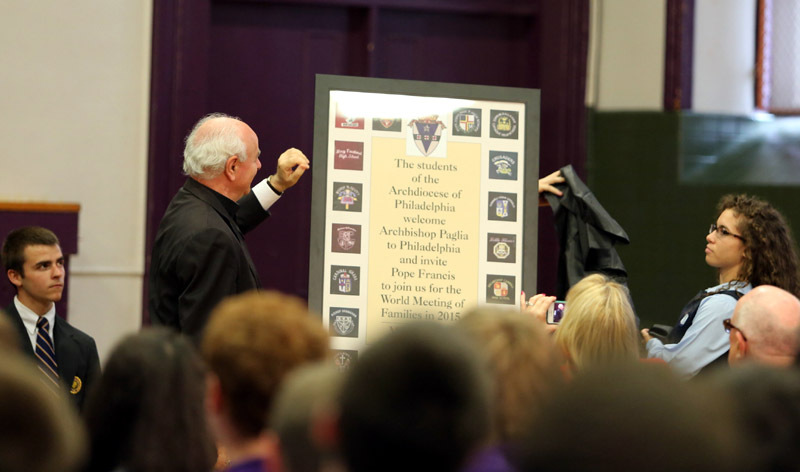 The Pope Francis invitation by the Roman & Hallahan students could not have been better. I am excited about the Pope coming to our city.